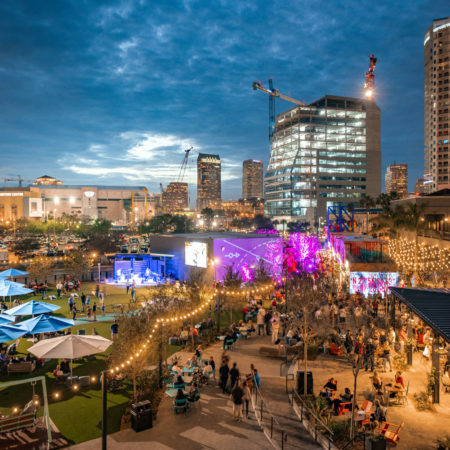 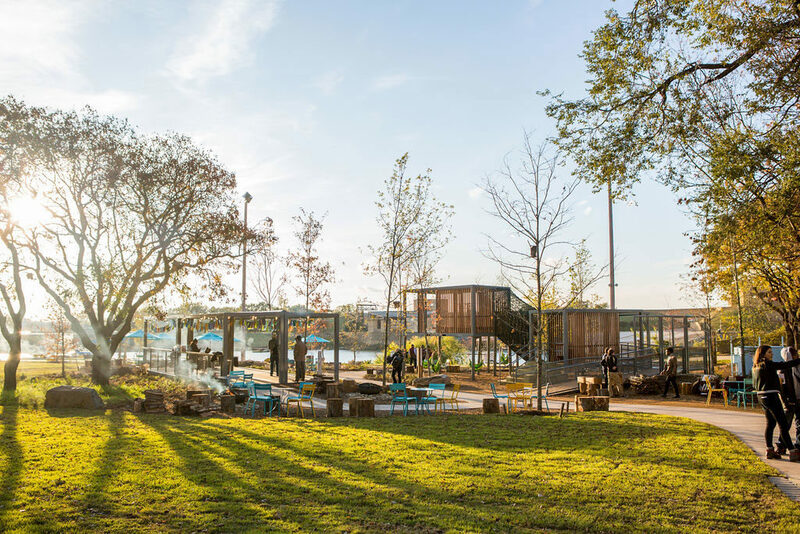 River Garden is a vibrant destination for connection, relaxation, and play. 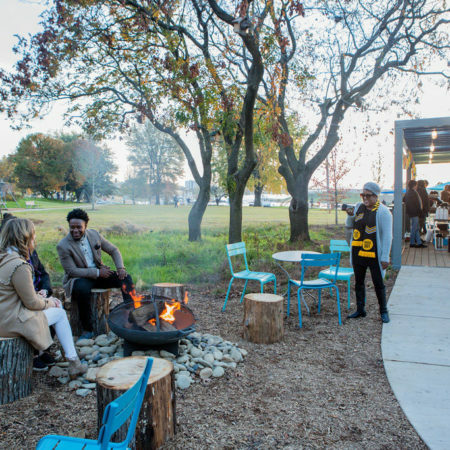 As part of the Riverwalk, the 2-acre revitalized park is poised to become a key social hub on the Memphis waterfront. 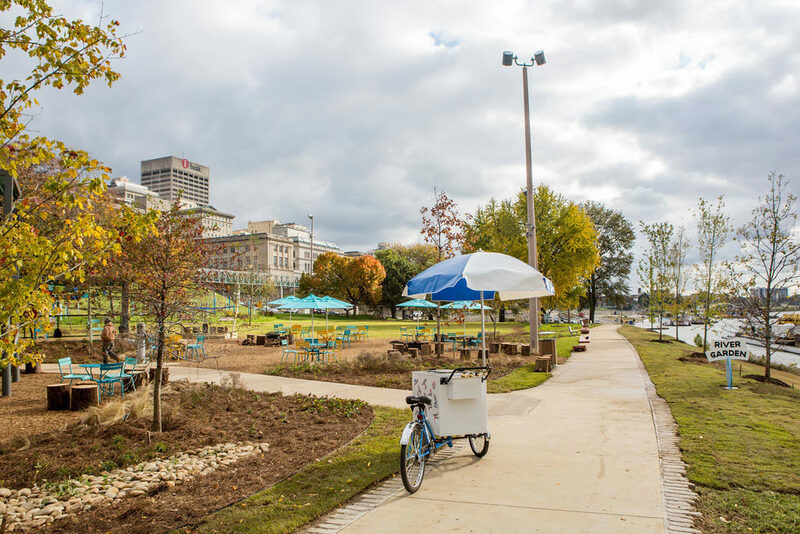 Previously known as Mississippi River Park, it sat for years as underutilized public space – an empty sea of lawn, existing only as a brief thoroughfare for joggers and bicyclists to pass through rather than a destination that Memphians could utilize or enjoy. 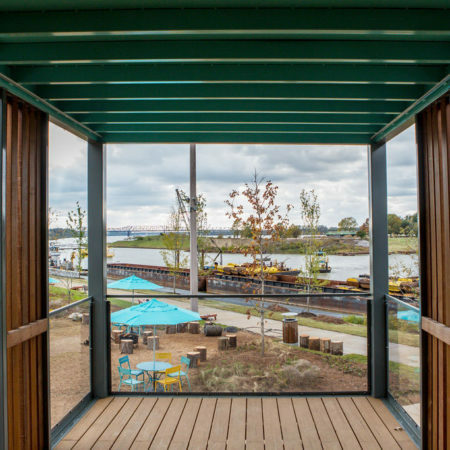 The park, however, is centrally located and holds particular significance in connecting the Memphis riverfront; situated as the crucial keystone piece, the park’s promise lies in the fact that it links 6-miles of riverfront public parks and trails, while also tying into the greater circulatory system to interface Downtown Memphis, Mud Island, and residential neighborhoods to its north and south. 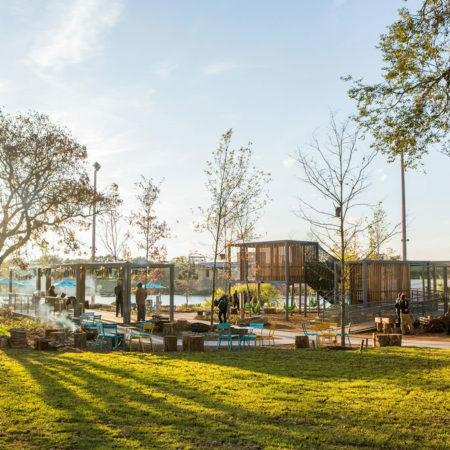 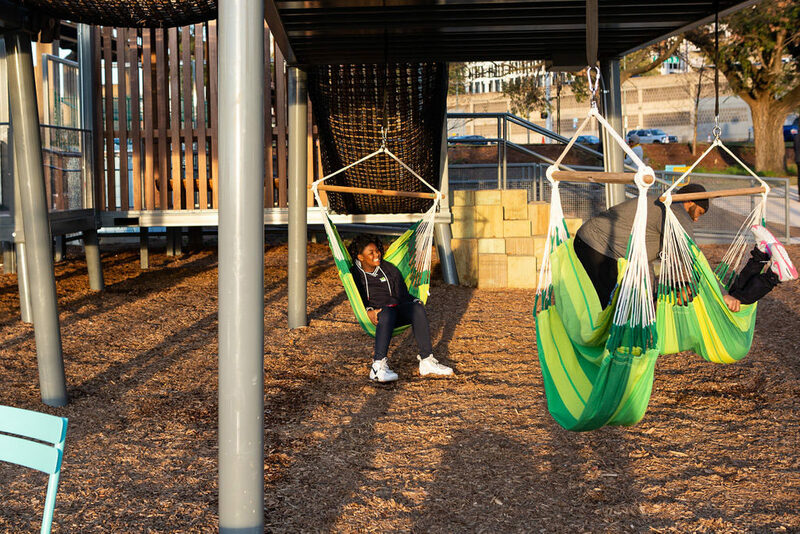 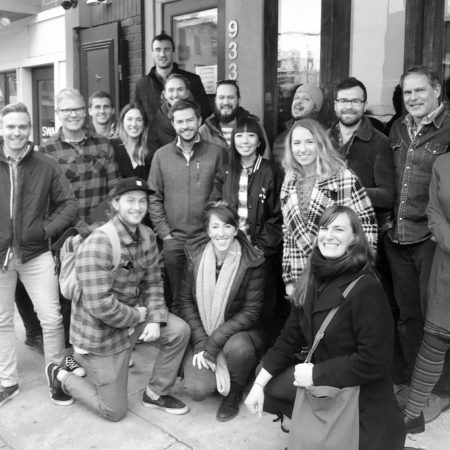 Given this, the design team refreshed the site as River Garden – a thoughtfully designed park featuring unique spaces to support flexible programming, casual athletics, and small-scale events. 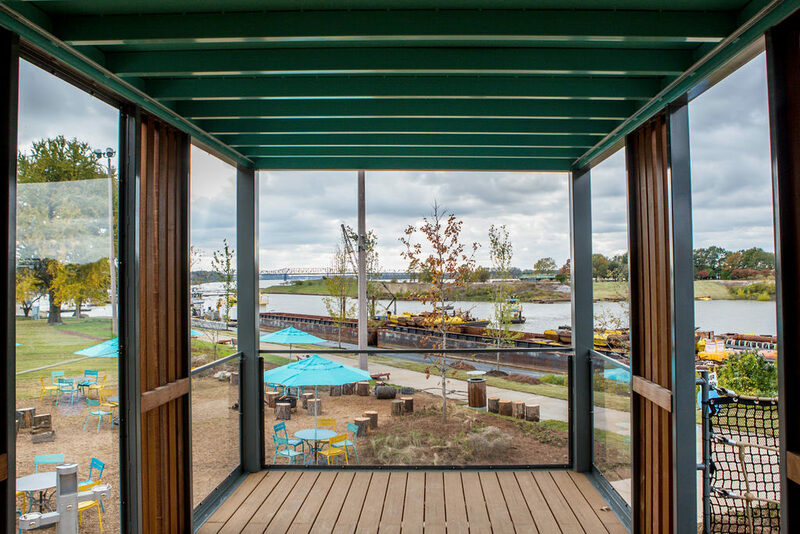 Strategically building off the site’s existing assets, the design updates enhance open green space, highlights panoramic river views, and embellishes the rolling topography along Riverside Drive. 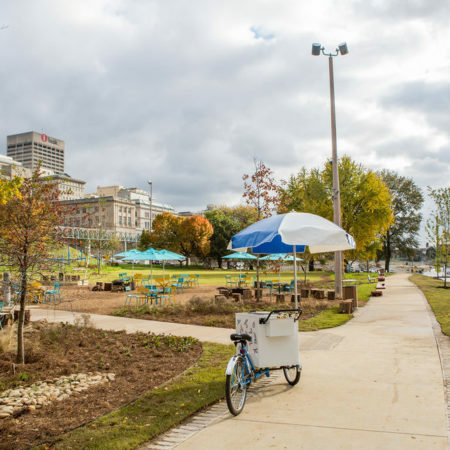 The result is a holistic reactivation of public space – a lively and dynamic park for all Memphians to call their own. 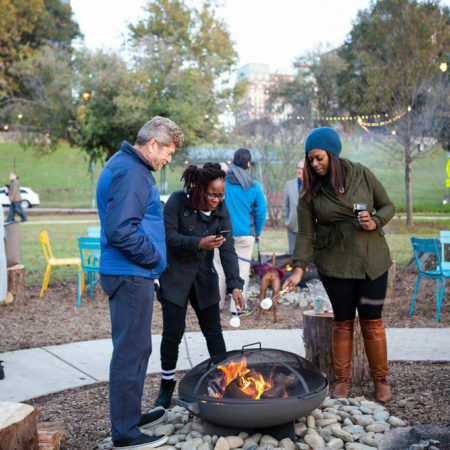 The central lawn remains open and relatively flat, welcoming recreational opportunities to the public. 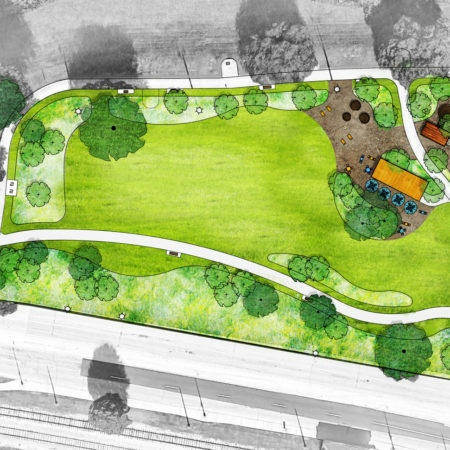 Specific improvements include the introduction of zoysia sod to replace the existing bermuda grass for a low maintenance, environmentally beneficial lawn capable of withstanding high levels of foot traffic. 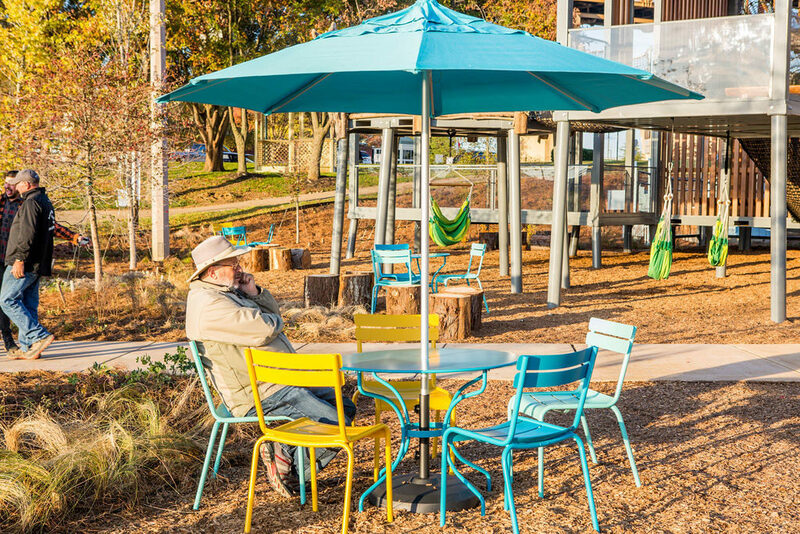 A meadow of native low grasses and wildflowers was introduced to provide a naturalistic experience to the riverfront, changing seasonally and providing habitat for local wildlife. 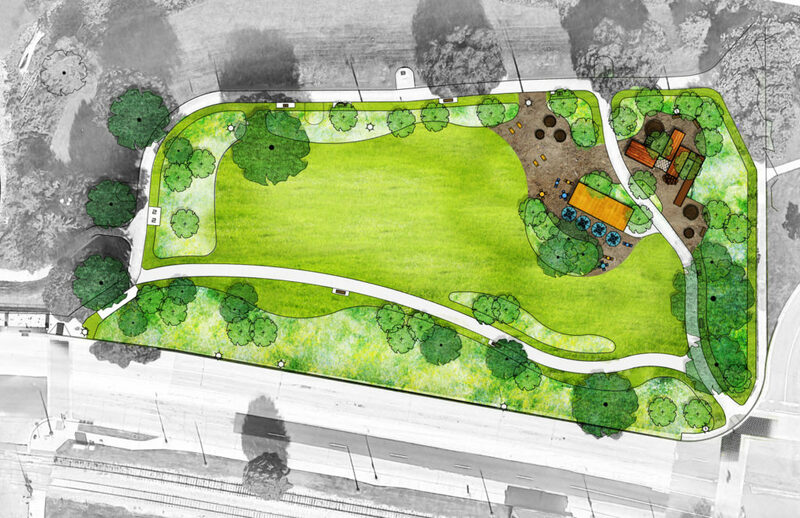 The massing of the meadow textures and plant varieties begin to shape the park, providing a buffer as necessary reprieve from the road while also softening the park’s pre-existing hard edges. 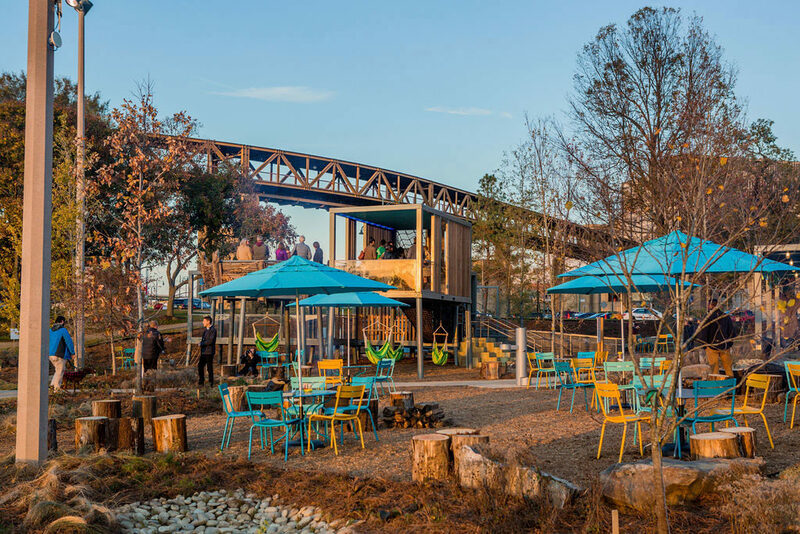 Although the overall appearance of River Garden’s landscape could be considered wilder and more informal than anything else currently found along the Memphis River Parks system (plant palette and form are inspired by native grass-dominant meadow typologies), the approach is strategic in its adaptation for the maintenance and security-needs of the public space. 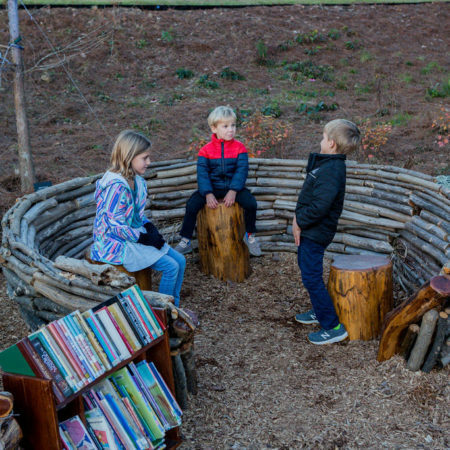 In particular, all plants were selected for their screening effects (growing up to 3-feet tall) while a mown edge preserves a perceived sense of cleanliness and stewardship. 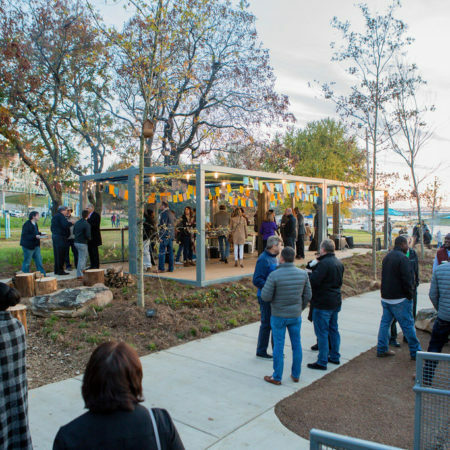 As many of the existing trees on site were preserved as possible – their age lends a sense of history to the Garden, while their large canopies provide the comfort of shade. 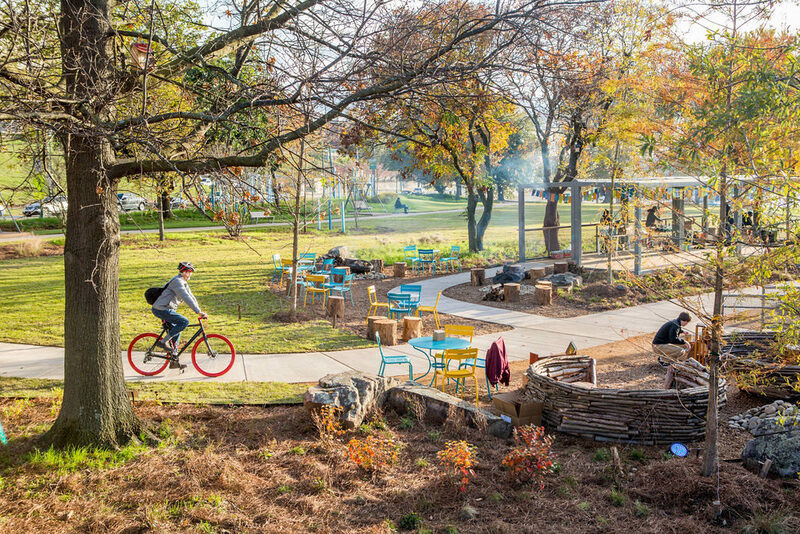 New paths were added to better connect pedestrians with existing tree infrastructure, organizing views and seating areas flexible to shrink or swell with programmatic needs. 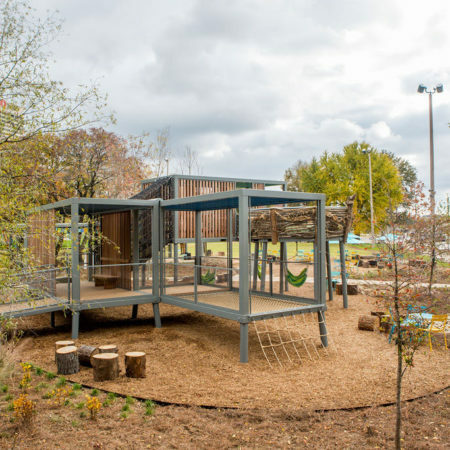 Additional canopy and understory trees were introduced to add diversity and interest to what was previously a monoculture. 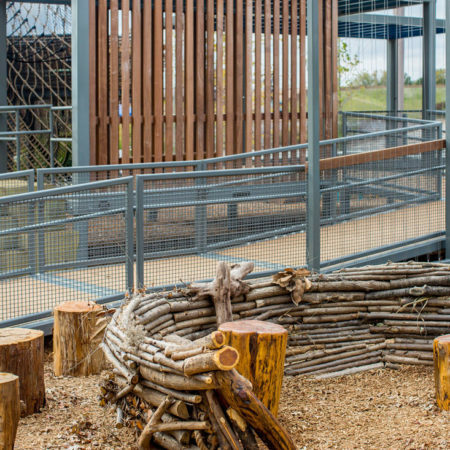 As part of this diversification of species, River Garden acts as a test arboretum for future development of planting schemes along the riverfront. 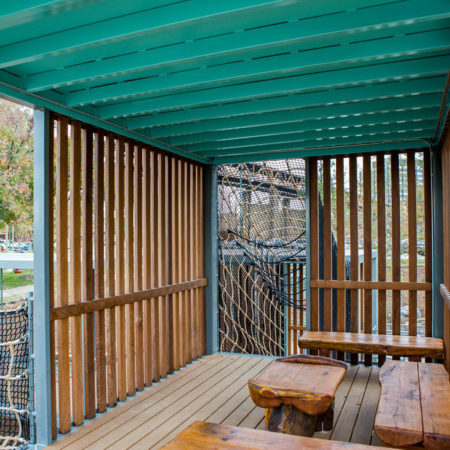 Two custom prefabricated structures and three human-scale birds’ nests have become River Garden’s iconic main attractions. 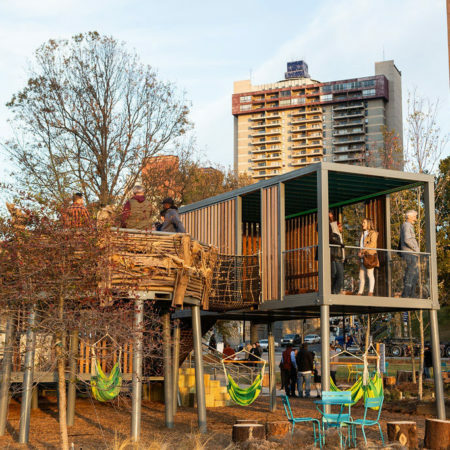 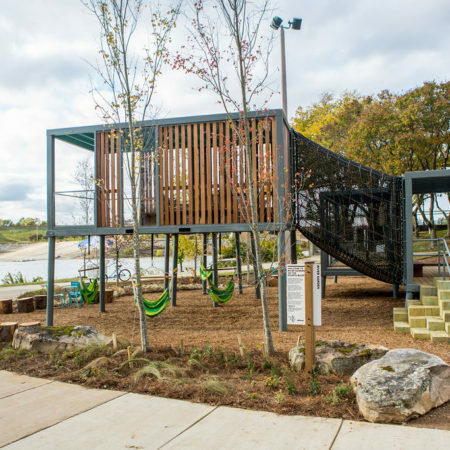 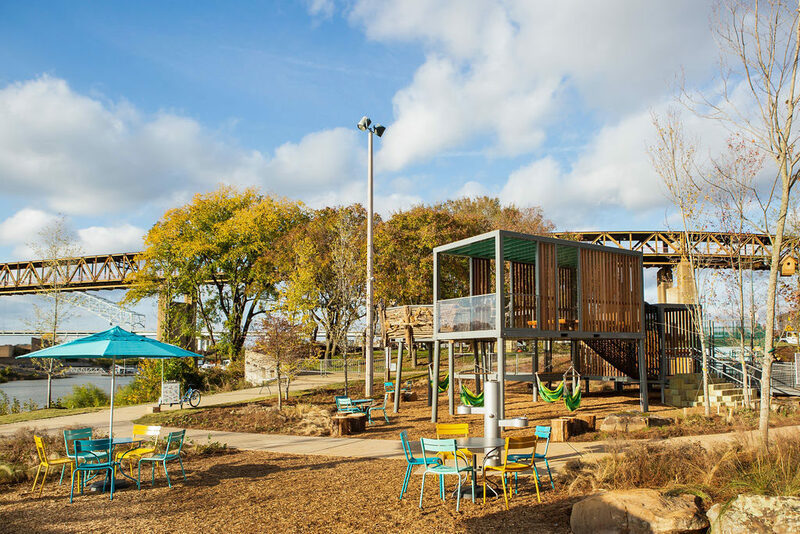 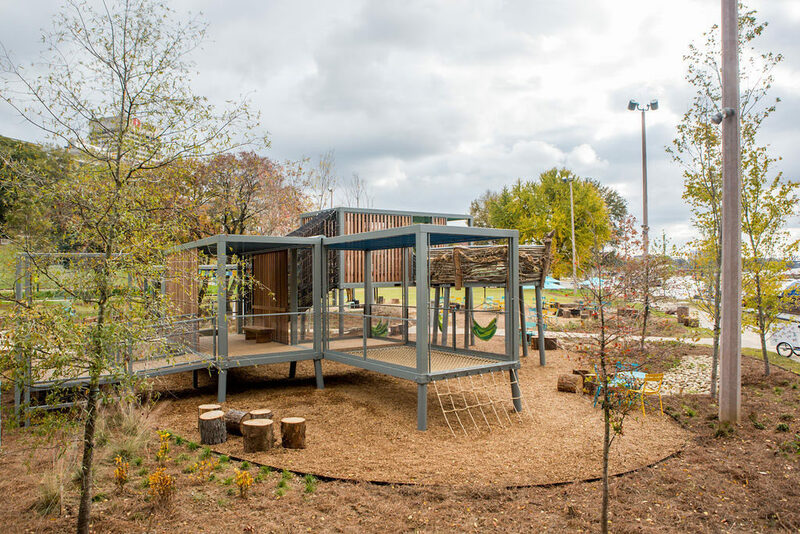 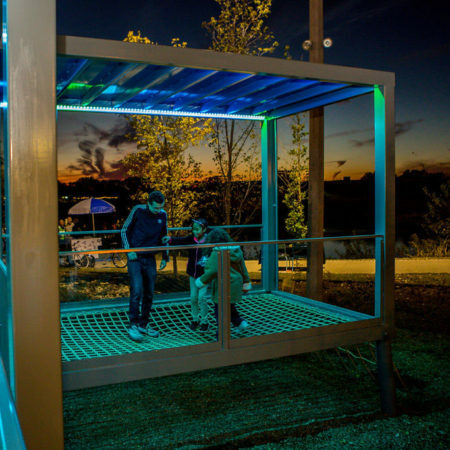 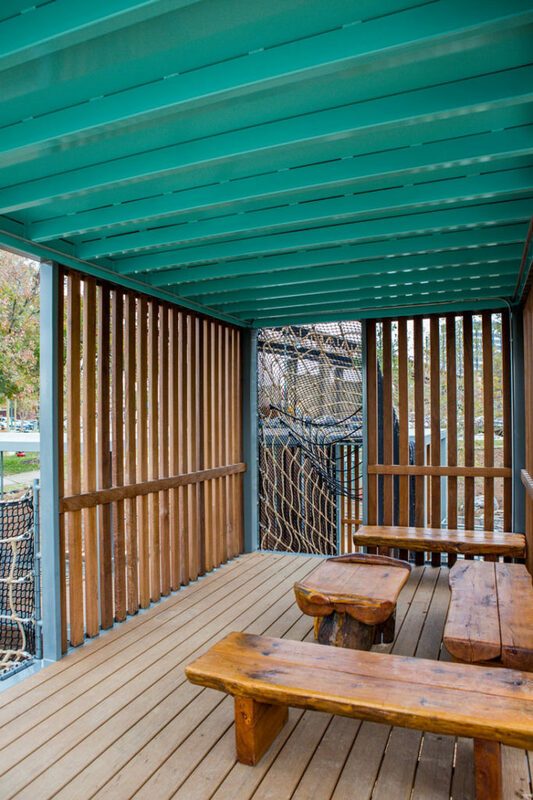 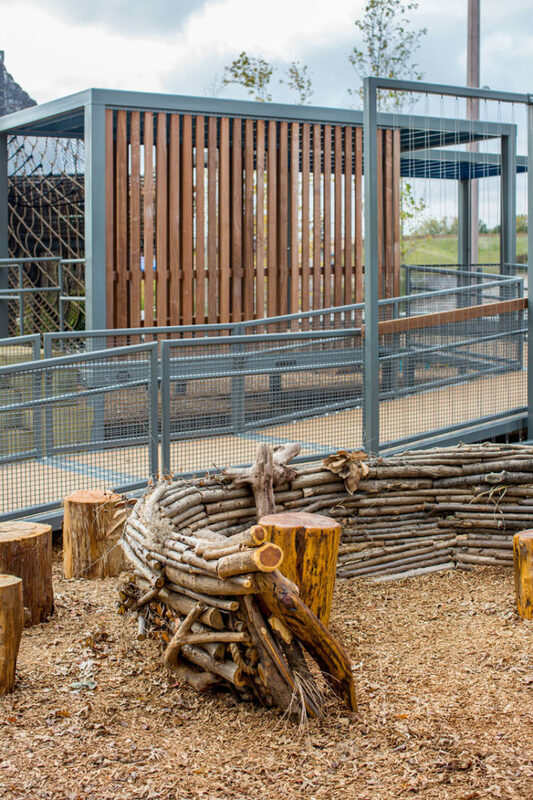 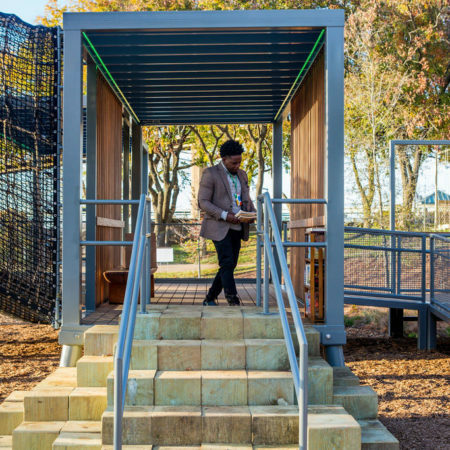 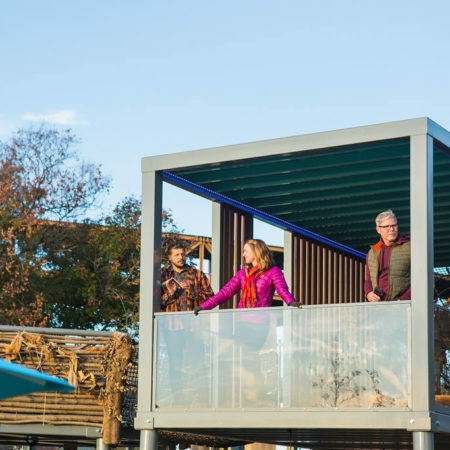 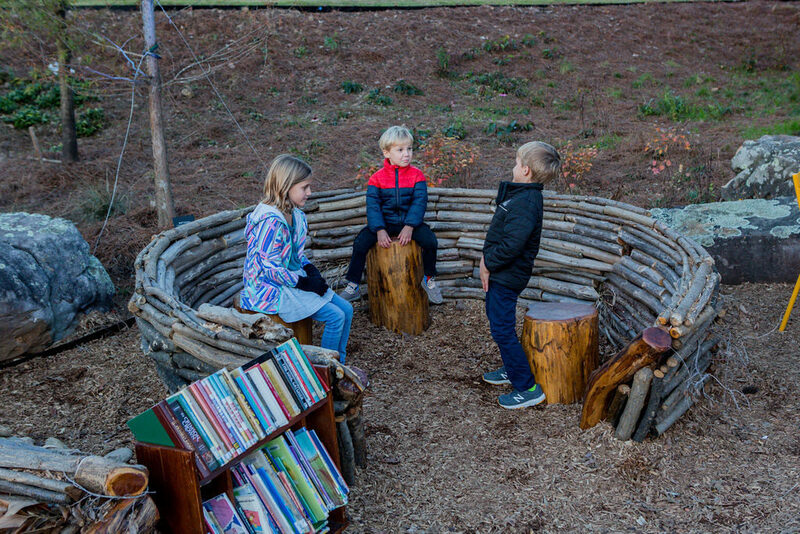 Located within the park’s northern extents, visitors find an open-air pavilion with flexible furnishings, paired with a playful, stilted “treehouse.” The design was inspired by cargo-laden barges that regularly flow along the adjacent Mississippi River. 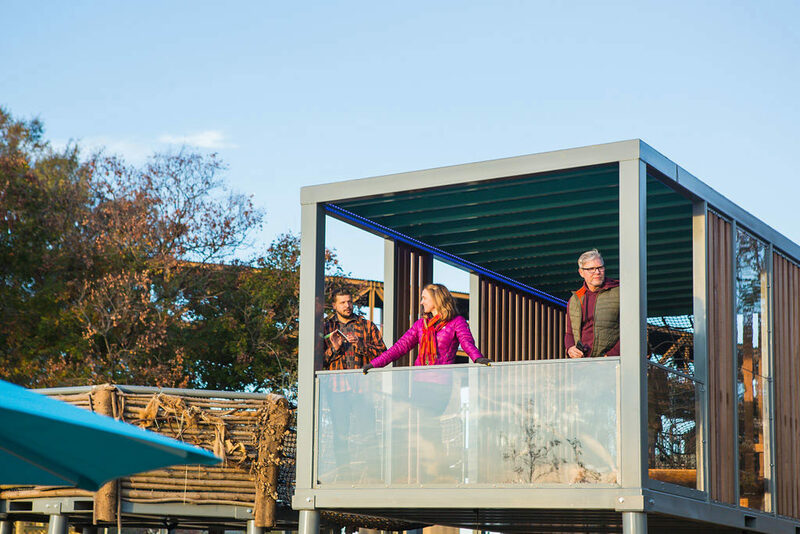 It is here that visitors can enjoy new elevated views of the riverfront and gather in social spaces of varying scales. 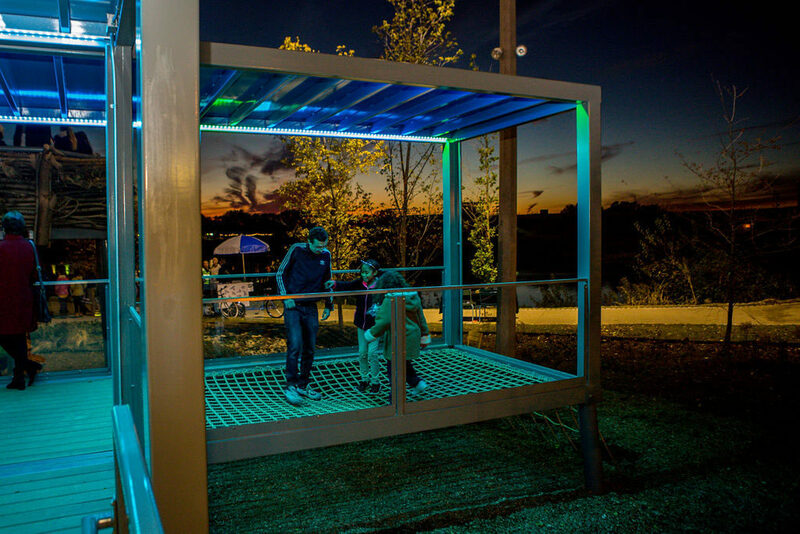 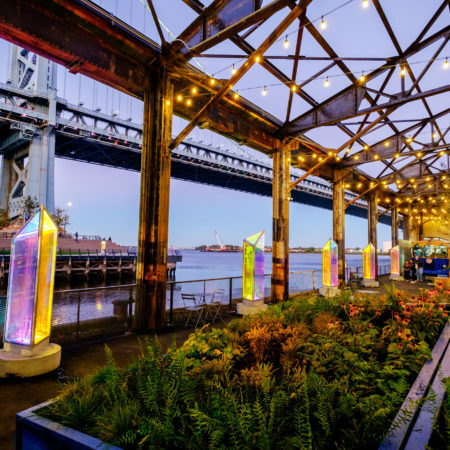 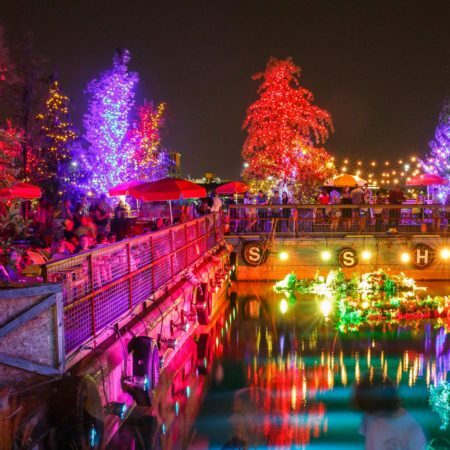 Designed with colorful LED lighting, the structures come alive at night, extending the hours of the park into the evening for possible events and continued recreation. 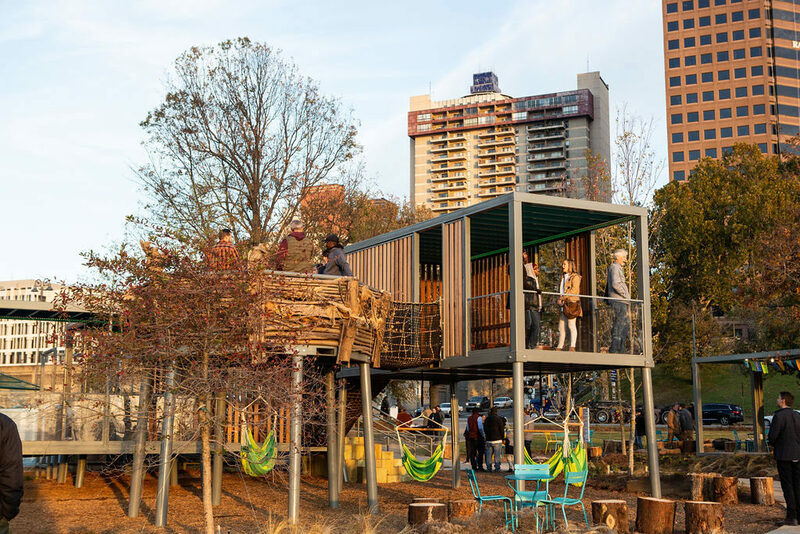 These highly-effective structures were the result of a collaborative design process, centered on the design challenge of finding novel means of prefabricating modular structures to accommodate and encourage people of all mobilities and ages to enjoy a sense of adventure in their everyday. 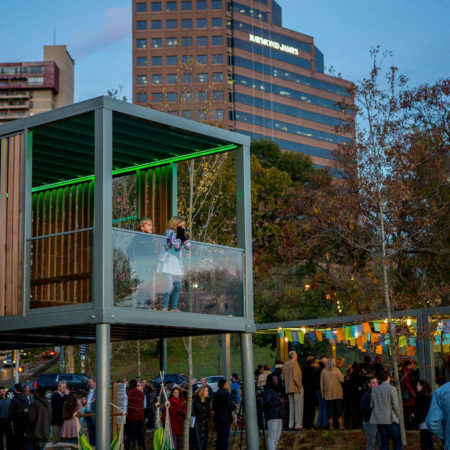 Treehouse and pavilion were manufactured off-site, shipped to Memphis, before being craned and assembled into position. 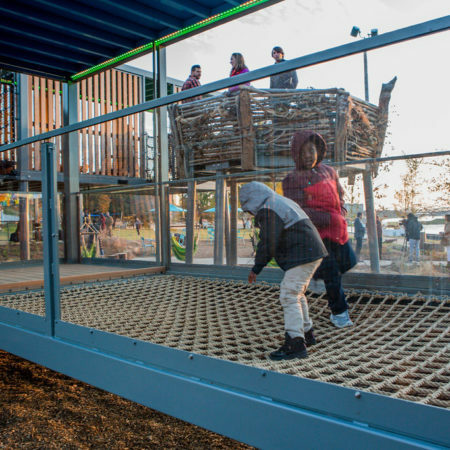 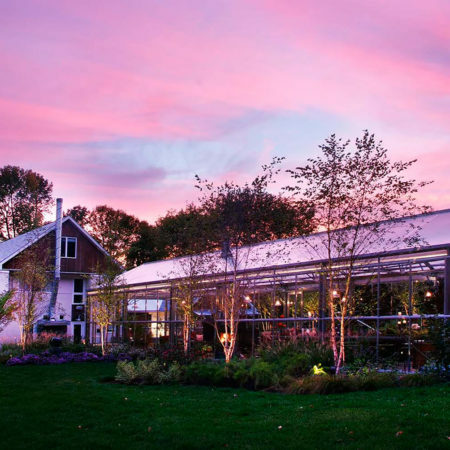 The result was both cost-effective and transformative of the site. 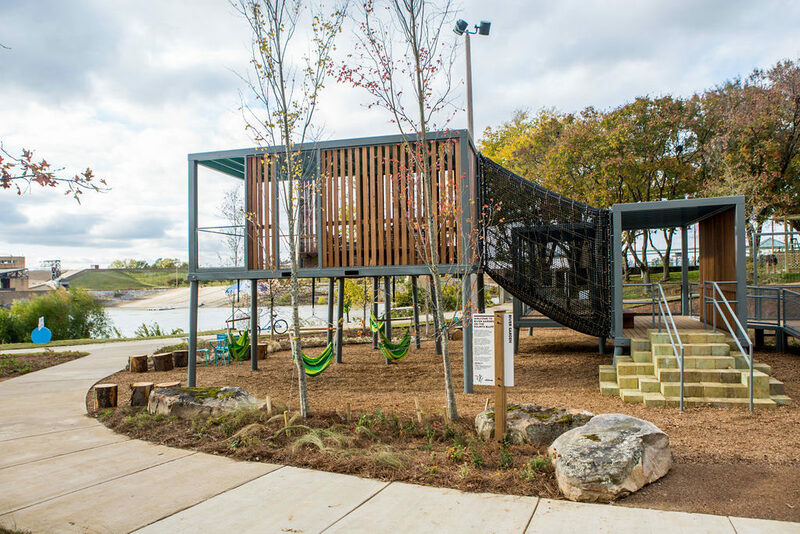 Human-scale birds’ nests add whimsy to the site and were inspired by a desire for naturalistic play elements, coupled with a celebration of wildlife along the River. 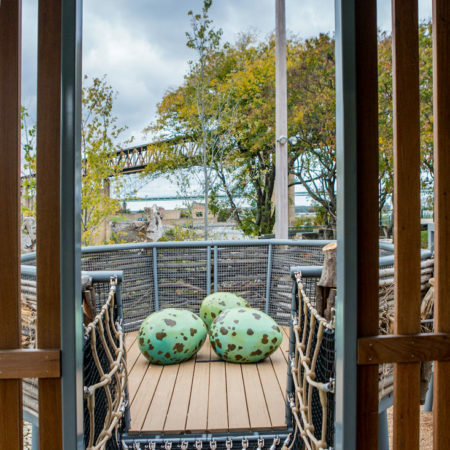 (The nests are very much of their place; the artist who created them harvested branches, vines and driftwood for their construction from the site’s adjacent river banks.) 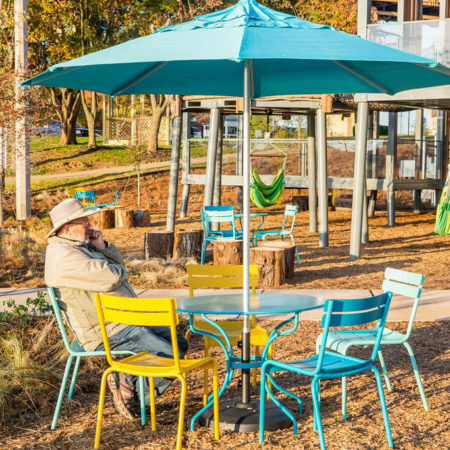 Situated on a soft bed of wood fiber at ground level, the nests are open and inviting, beckoning park-goers to come sit and play inside. 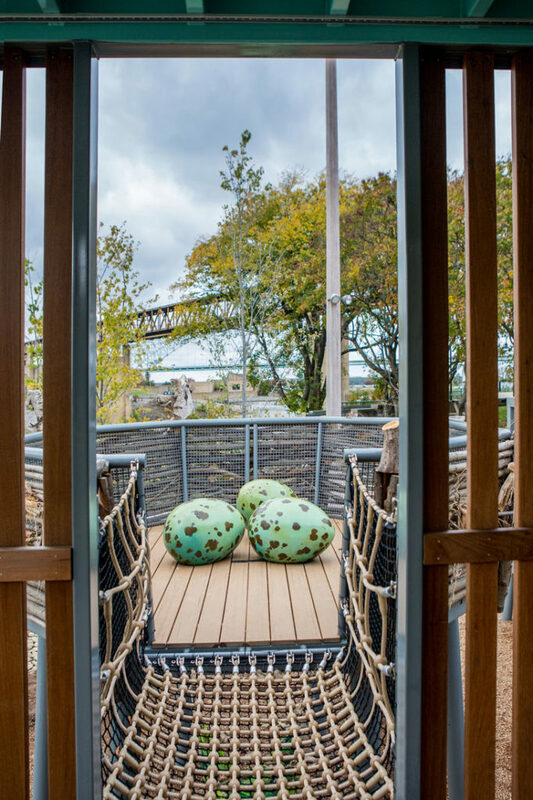 Upon accessing the elevated nest from the treehouse, visitors discover a cluster of oversized cheerfully speckled blue Mockingbird eggs meant to inspire a sense of curiosity, wonder, and fun. 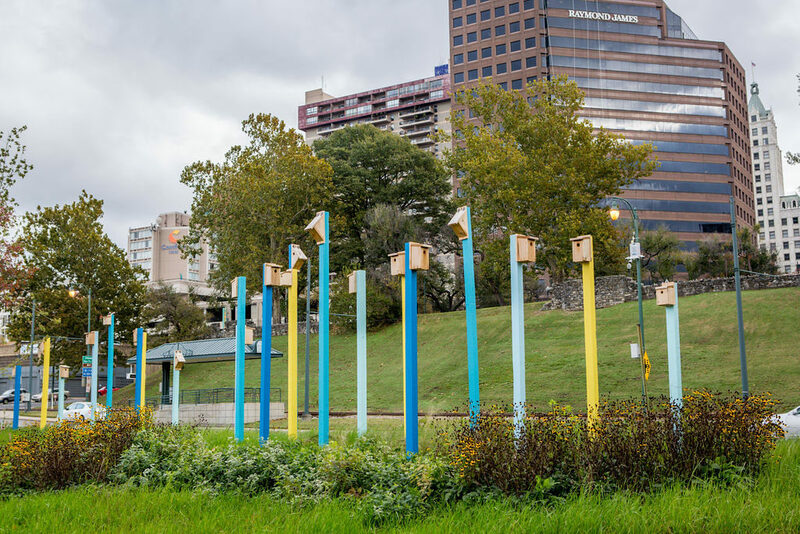 Additionally, a collection of eclectic and colorful birdhouses are hidden throughout the park, perpetuating that cohesive avian theme. 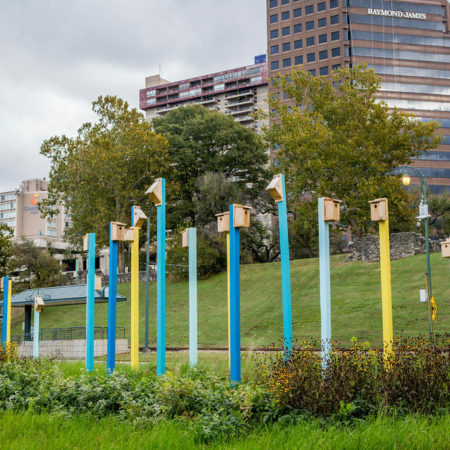 These birdhouses offer both new habitat for the river’s bird communities, as well as observational and educational opportunities for visitors to learn about the local wildlife. 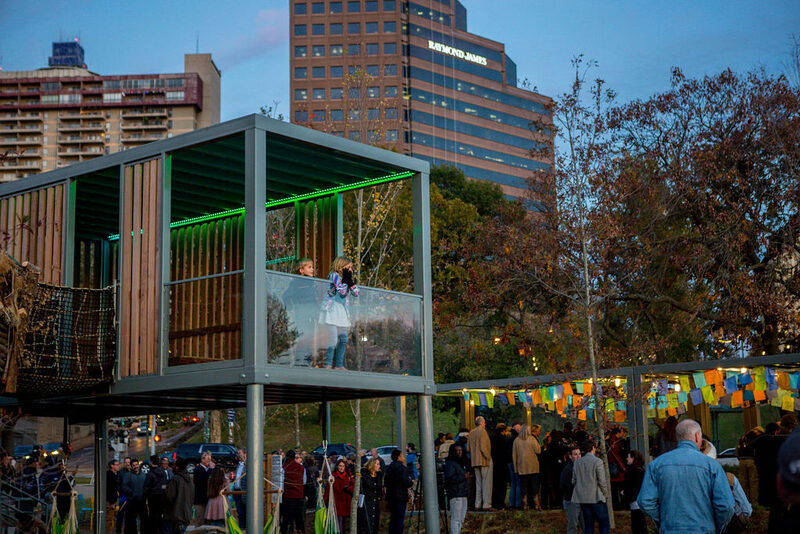 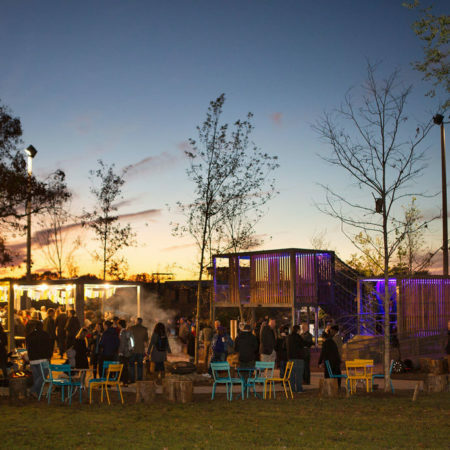 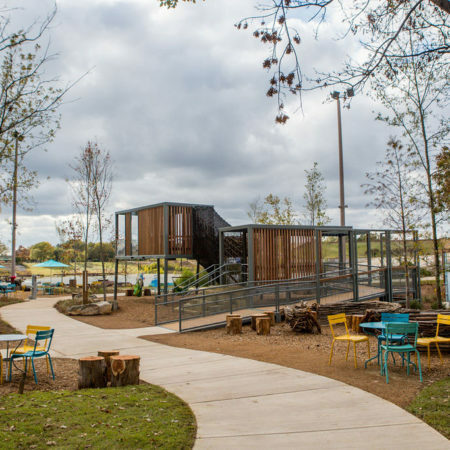 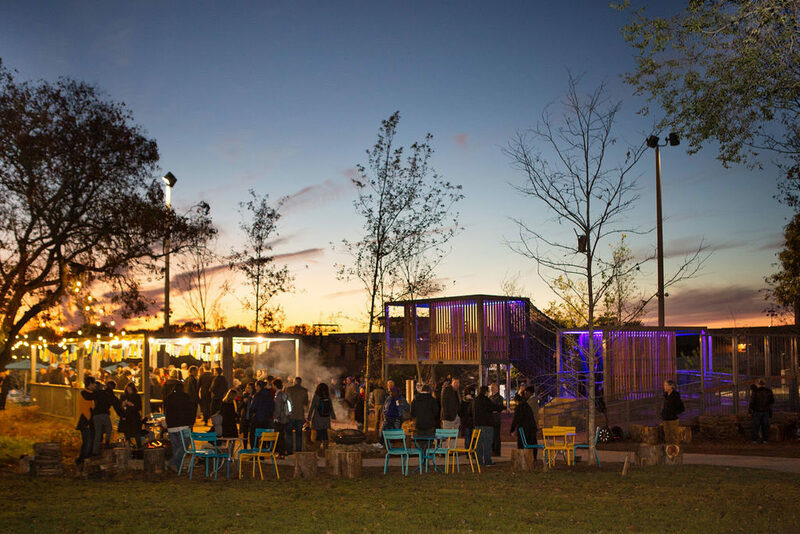 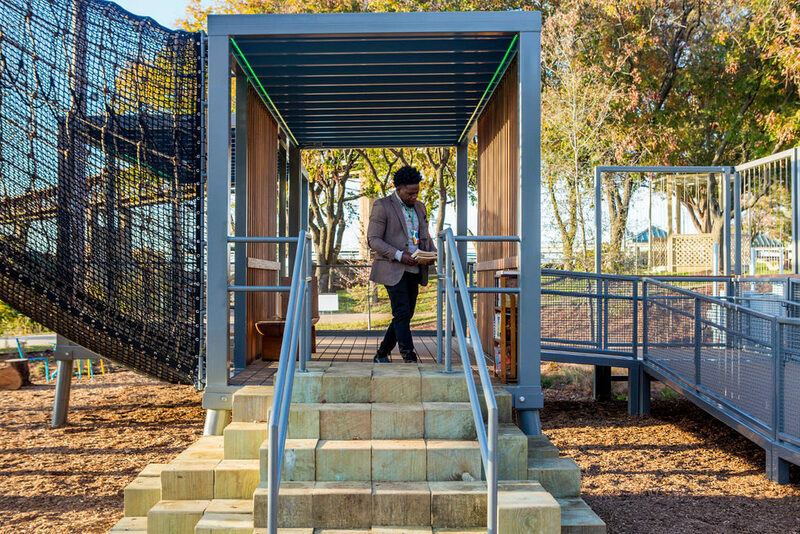 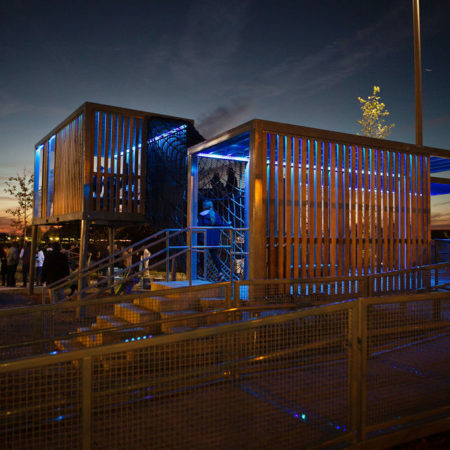 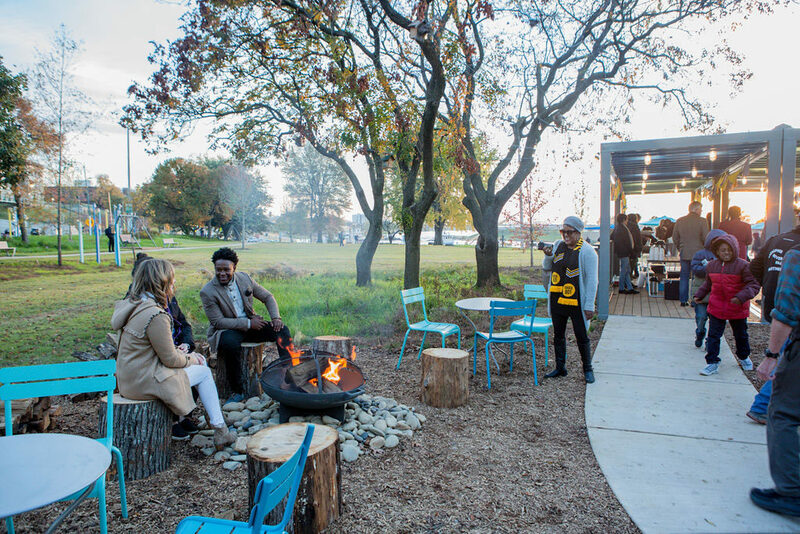 Furthermore, to provide opportunities for local business, a small-footprint shipping container was also repurposed and placed on-site to become the park’s pop-up cafe. 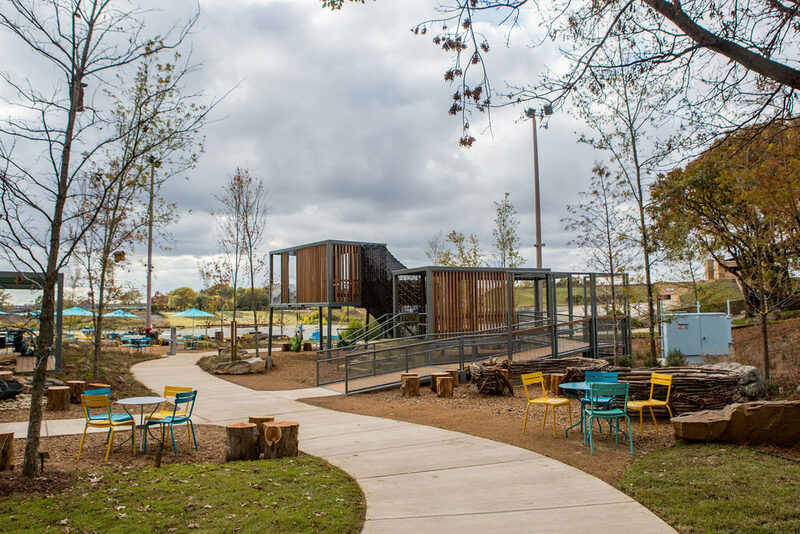 Vibrantly outfitted in jubilant colors and patterning, the container hosts a satellite operation from a local coffee shop to retail beverages and treats for park visitors to purchase. 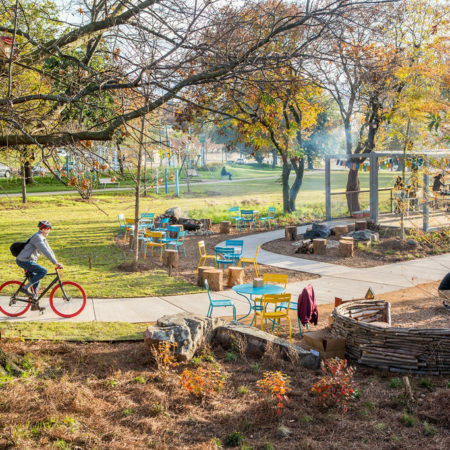 A well-designed park system is nothing without the support and engagement of its community members. 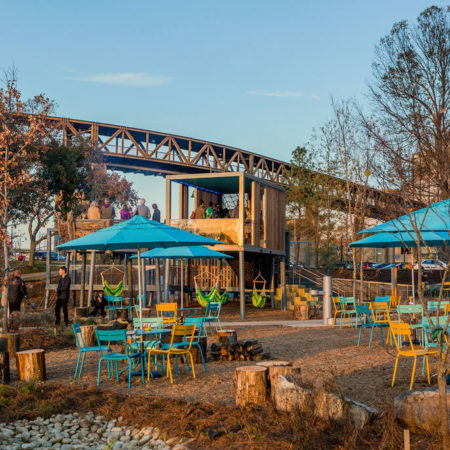 With this at the core of the team’s design principles, a series of community engagement opportunities were organized throughout the design process and thereafter to inspire and involve Memphians to take stake in River Garden. 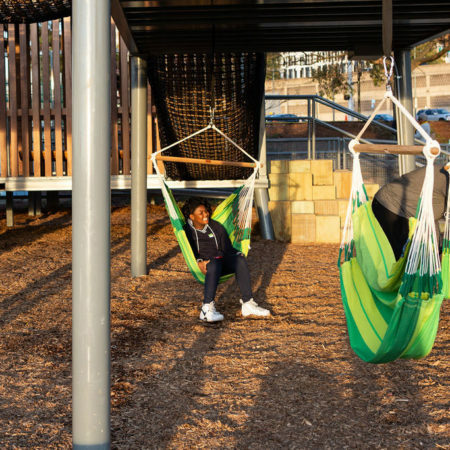 Design workshops were held inviting youths to develop their own schemes for gathering spaces that were inspired by the giant birds’ nests. 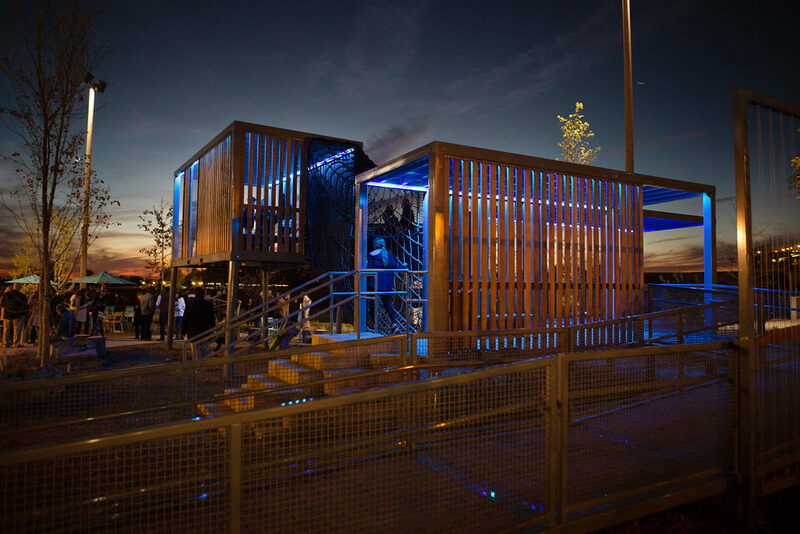 A design was selected from the workshops and the youth-teams helped construct their visions onsite. 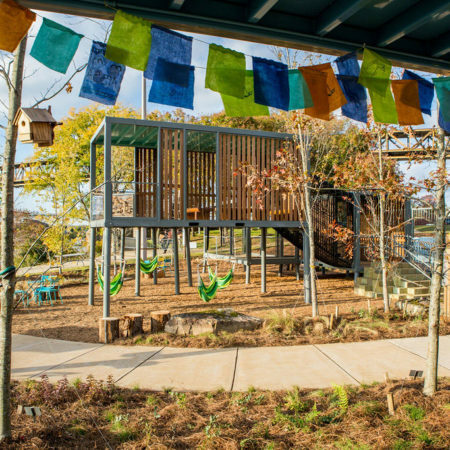 Working side-by-side was central to the identity of a collaborative River Garden. 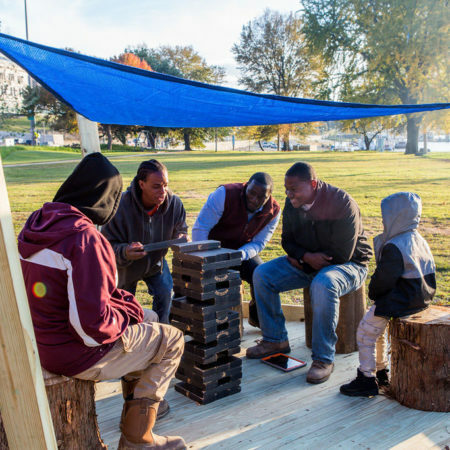 Also prior to the Garden’s opening, the team hosted a community-flag making event that encouraged local residents to come make their mark and blessings on the riverfront, as their very own public park. 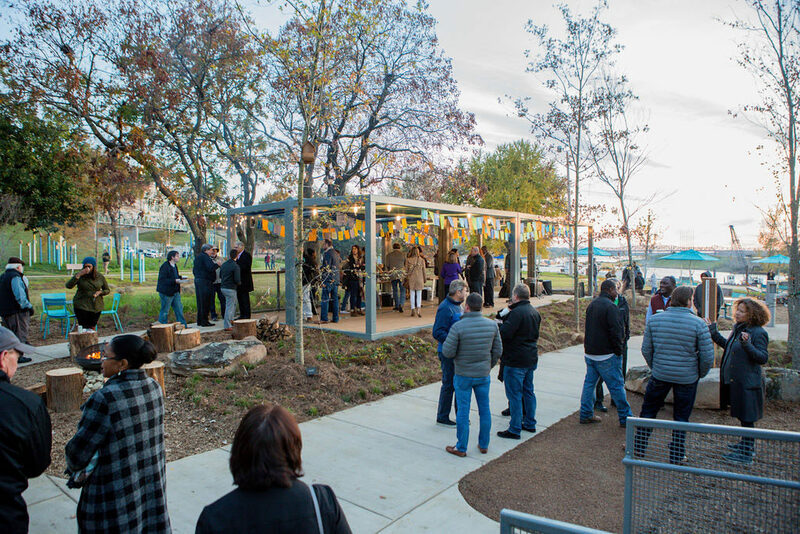 When the flags were completed, they were strung under the pavilion structures in celebration of the lively new public space, ever becoming all Memphians’ to share. 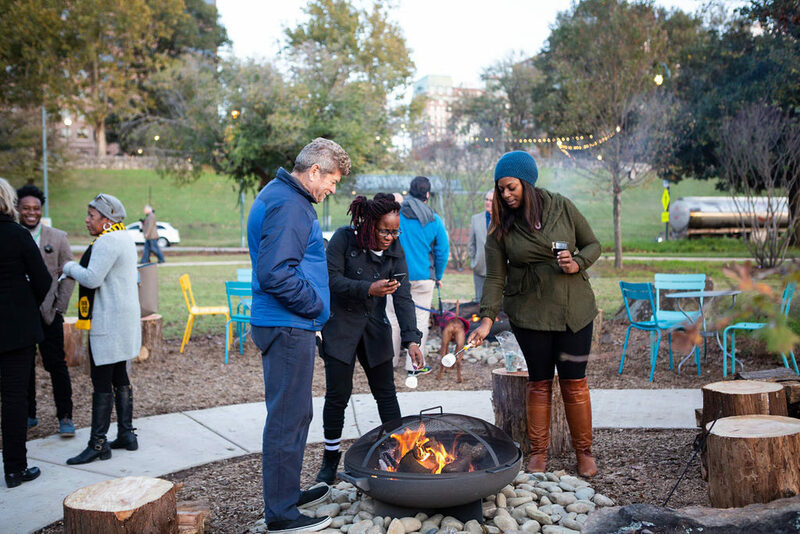 In consideration of the future of River Garden, the team has also worked in extensive collaboration with the Memphis River Parks Partnership to create new programs calling for locals to become Park Ambassadors and Visitors Guides. 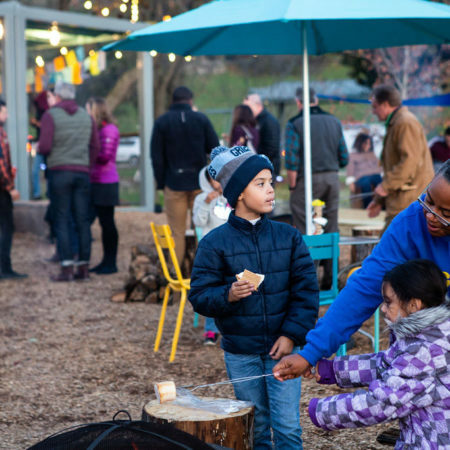 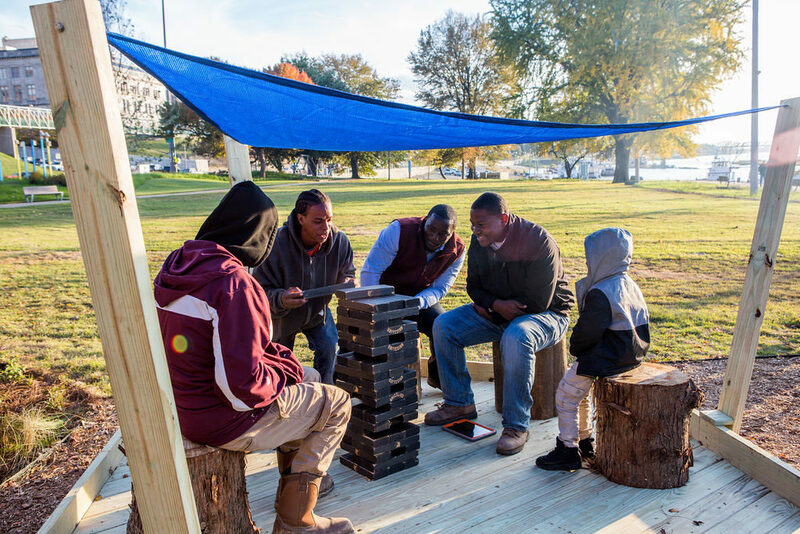 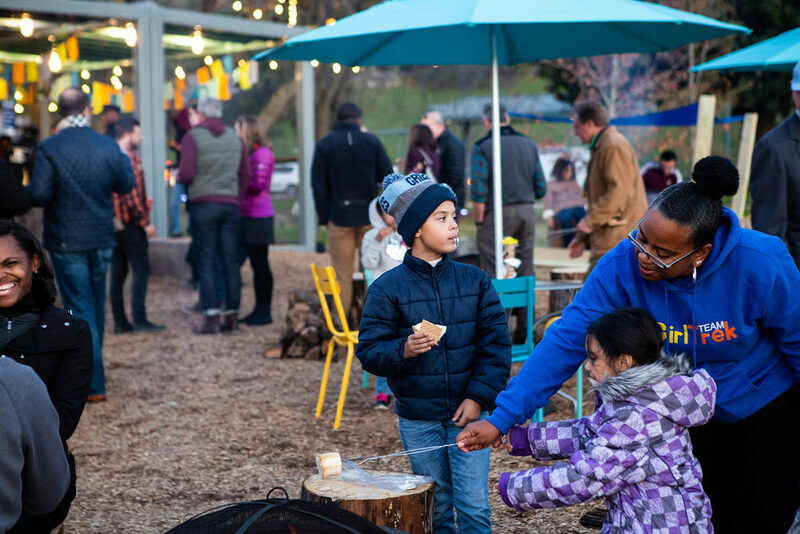 Such programs catalyze and promote the emotional investment for and stewardship of all Memphis River Parks projects – early and consistent engagement with and from the public is vital to their future success of all public space projects. 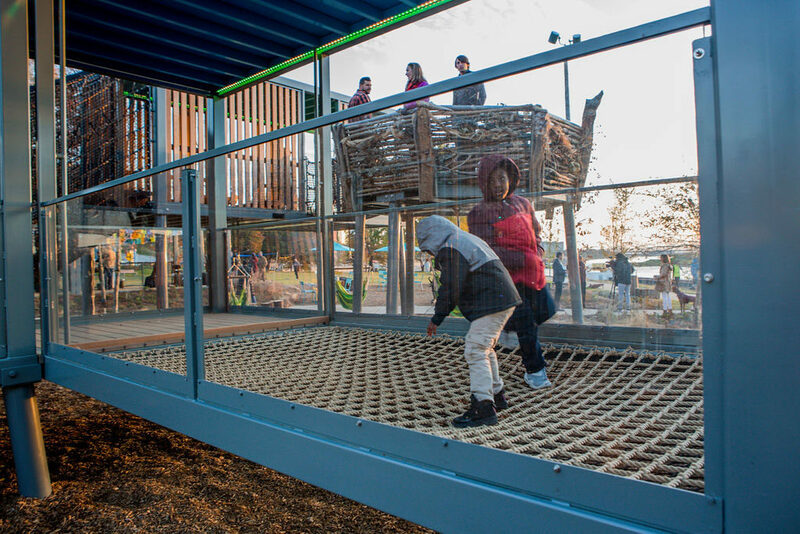 The team has already been overwhelmed by the level of enthusiasm and interests in these programs, and carry this optimism forward in plans for the future development of the larger river parks system. 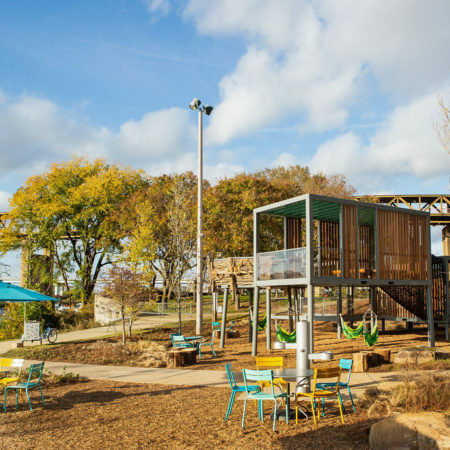 As both the keystone piece and the first of public parks revitalization projects along the riverfront, River Garden has become the testing grounds for a methodology and model approach in the adaptive reuse of future parks projects of larger scale along the river (including: Memphis Park, Mud Island, Beale Street Landing, and Tom Lee Park). 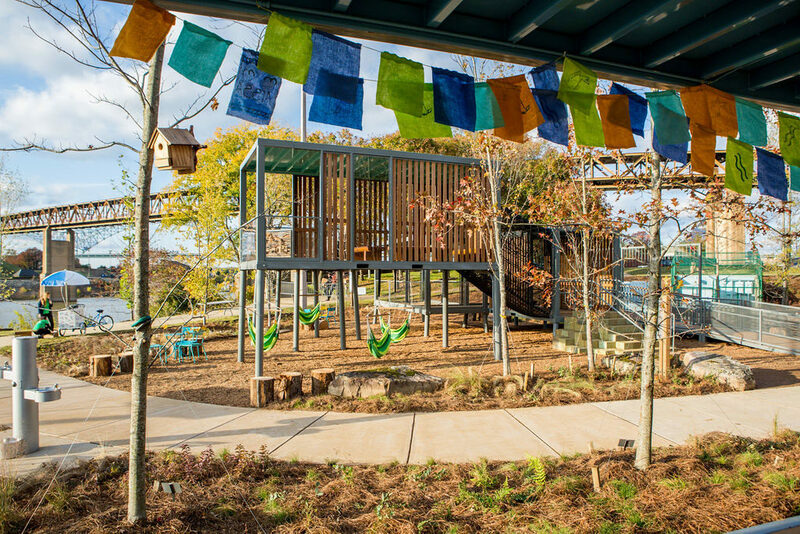 While time will reveal lessons from the naturalized plant strategies and test maintenance capabilities, what can be gleaned so far is that the sensitive shaping of space through vegetation and flexible furnishings, the crafting of low-cost play structures for the inclusion of all, and the consistent engagement of the community throughout have proven for the successful activation of River Garden that all Memphians can take pride in as their own.